FILE - Facebook CEO Mark Zuckerberg walks at the company's headquarters in Menlo Park, Calif., April 4, 2013. A scandal in March 2018 over misuse of the personal data of Facebook users wiped $60 billion off the company's value. Facebook users in Southeast Asia, particularly the Philippines, were especially exposed to recent data privacy breaches due to high user numbers and the popularity of an app at the core of the problem, analysts believe. According to Facebook figures, the data of 1.175 million users in the Philippines may have been “improperly shared” with London-based voter profiling firm Cambridge Analytica. That estimate is the second highest, single-country total after the United States. Indonesia ranks third at around 1.1 million people exposed to data breaches. Vietnam was ninth with 427,000. Filipinos had also enjoyed a personality quiz app that spread fast due to the sharing of results, said Renato Reyes, secretary general of the Bagong Alyansang Makabaya alliance of social causes in Manila. The app is suspected as a source of Cambridge Analytica data. In Vietnam, where the media outlet VnExpress International estimates 64 million of the country’s 92 million people use Facebook, younger people like the outlet to show off, technology specialists say. Indonesians use it to communicate for free across their 13,000 islands, some impoverished. The Silicon Valley social media giant said that beginning April 9 it would add a News Feed link for users to see what information they have shared on which apps. “I think we are in a position to demand an explanation directly from the officials at Facebook considering that we are the second highest country in net exposure,” Reyes said. Data from about 87 million users worldwide may have been improperly shared with Cambridge Analytica, Facebook says. Southeast Asia faced exposure because a rise in the number of “affordable” mobile phones has expanded consumption of news on social media, said Athina Karatzogianni, associate professor in media, communication and sociology at the University of Leicester in the United Kingdom. Total smartphone shipments in emerging Southeast Asia came to about 100 million last year, according to the market research firm IDC. In parts of the subcontinent, people rely on Facebook as an easy, free means to share news and images with family or friends across long distances, said Lam Nguyen, country manager with IDC. 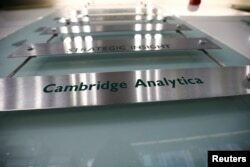 Filipinos worry that Cambridge Analytica’s parent company crunched the results of the personality quiz app to grasp voter psychology for targeted advertising on behalf of political campaigns, Reyes said. It may have taken the Philippine 2016 election as a “laboratory” for the U.S. presidential race later that year, he said. Cambridge Analytica says independent research contractor GSR “licensed data” from no more than 30 million users and that no information was used for the 2016 U.S. presidential election. The organization took legal action against GSR. “The use of personal data in order to influence the outcome of elections is really a cause for concern,” Reyes said. The Philippine National Privacy Commission has required Facebook to give updates on controlling against any further risk, the commission said Friday. Any data leaked would have arisen from use of University of Cambridge academic psychologist Aleksandr Kogan’s personality quiz app, it said. In Vietnam, Facebook took off about 11 years ago along with emerging wealth, including access to other foreign goods and services. A lot of people use Facebook to show off travel photos, said Phuong Hong, communications director with an app developer in Ho Chi Minh City. Such elaborate public posting exposes users to information harvesting, she said. “In Vietnam, people (are) more open and they don’t as much realize the impact if they publish all their information on social channels,” she said. 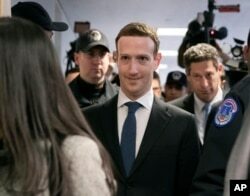 Facebook CEO Mark Zuckerberg arrives on Capitol Hill in Washington, April 9, 2018, to meet with Sen. Dianne Feinstein, D-Calif., the ranking member of the Senate Judiciary Committee. “Just some highly well educated people who already know about the after effects will try to limit it by themselves, but most of young, from 14 to 25, and even older people 25 to 40, they just go to that site, create an account and just follow to what Facebook asks for to fill in the information,” she added. Facebook users in Vietnam may remember a breach four years ago that let phone numbers and e-mails find their way to marketers, Nguyen said. “When the (Cambridge Analytica) story came to light, I think a lot of Facebook users here in Vietnam were kind of like ah, OK, so now it comes to light, but we already know our personal data have been breached a couple of years ago already," he said. Vietnam’s national defense and diplomatic officials met last week to discuss “internet security” with an eye toward Facebook, VnExpress International said. In Indonesia, the communications minister met the Indonesian Facebook public policy head April 5 to discuss any “abuse” of user data, the Ministry of Communication and Informatics said on its website. The number of Indonesian Facebook users had reached 130 million in January, 6 percent of the world total.